ManufactOn is a collaborative, cloud, and mobile solution for prefab production and supply chain management. We found ManufactOn to help the construction industry leverage the power of prefabrication, with tools that integrate supply chain, prefab production, and planning. 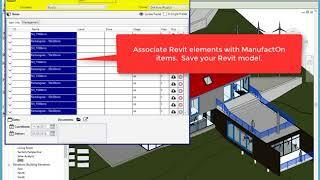 ManufactOn's Autodesk® Revit® plugin allows users to connect model elements to the ManufactOn construction supply chain management platform. Users can publish prefab packages, associate model elements to the package and track the progress through planning, coordination, detailing, manufacturing, QA through delivery. Downstream integration with Autodesk® BIM 360® online model viewing will allow project teams to instantly visualize their material stream, status, and key dates all in a rich, 3D model environment.